Passed away peacefully in the loving hands of his family 31.3.2019 aged 81. Cherished husband of Betty for 61 years. Much loved dad and father-in-law of Stephen and Giulia, Colin and Chrystine, Ken and Frances. 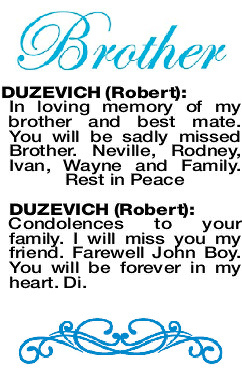 Adored and loved Grandad of 7 and Great Grandad of 11. 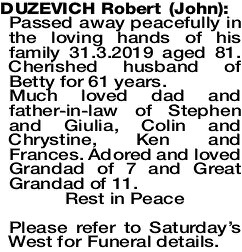 Please refer to Saturday's West for Funeral details. 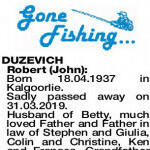 The Funeral Service for Mr Robert (John) Duzevich of South Yunderup formerly of Kalamunda and Narrogin will take place in our Chapel, 312 South Street, Hilton commencing at 10:30am THURSDAY (18.04.2019). Cremation will take place privately at a later time. Very fond memories of a great working relationship with John at Actrol. Sincere condolences to Betty and Family. Rest In Peace. Sadly passed away on 31.03.2019. Husband of Betty, much loved Father and Father in law of Stephen and Giulia, Colin and Christine, Ken and Frances. Grandfather of 7, Great Grandfather of 10 plus one on the way. We all miss you. Love Ken and Frances. Very sad to see you go Dad, we all love you very much. Ken and Frances, Tegan, Danny, Jake, Abbey and Tyson, Kim, Aiden,Taj and Winter, Tom and Amanda, Reece Jacinta and Zayah. Condolences to your family. I will miss you my friend. Farewell John Boy. You will be forever in my heart. Di. 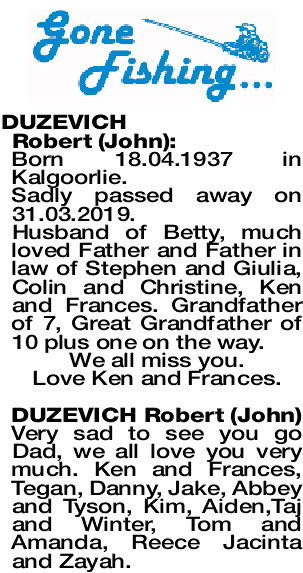 Deepest sympathy to Stephen, Colin, Kenny and families on the sad loss of your beloved Father. 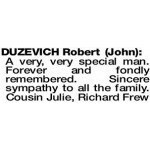 Deepest sympathy to all the family with the sad passing of cousin John. Ron, Jenny, Mat, Gordon. Deepest sympathy to Betty and Family. We'll miss our chats on the phone. God Bless, Ray and Leslie Routledge. A devoted family man who has left a wonderful legacy. 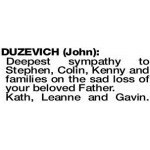 Sincere sympathy to Ken and Frances and the Duzevich family. 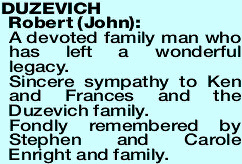 Fondly remembered by Stephen and Carole Enright and family. 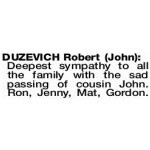 DUZEVICH ROBERT JOHN Deepest sympathy to Betty and family on the passing of our good friend John Great memories of our African trip together.